A small tract of land in the southwest corner of the former Horace Williams Airport property will be the site of the University’s latest renewable energy project, this one powered by the sun — UNC’s first solar farm. Plans are being finalized for a state-of-the-art solar farm on the 2.7-acre site, combining photovoltaic panels that convert sunlight into electricity with a battery storage system for any electricity that is not immediately consumed. The energy stored by the batteries can be discharged as needed, either very slowly or as quickly as within four hours. The solar and storage project aim to offset some of the University’s energy purchases and advance its goal to become greenhouse gas neutral. The solar panels will help power the buildings along Airport Drive. At its peak, the solar output could handle about a third of the load for that area on a given day, which would reduce what is purchased from Duke Energy. The tract is part of the 1,000-acre Carolina North satellite campus, a gift from philosophy professor Horace Williams early in the 20th century. In addition, the battery storage system provides flexibility in deciding when to use solar energy and how much to store for future use. The battery storage system also can be charged from Duke Energy’s grid at times when low-cost power is available. It will be one of the largest battery installations for Duke Energy. Smaller-scale solar projects use rooftop panels like those on the Frank Porter Graham Student Union, the Bell Tower parking deck and the N.C. Botanical Garden’s Education Center. While most Duke Energy solar projects connect power directly to the grid, Carolina’s system will connect from the former airport property to switches on Airport Drive, with the interconnection to Duke Energy on Homestead Road, a couple of miles away. The project is expected to be ready for bid this fall, with anticipated completion in spring 2019. The fixed-structure array will include 1,350 two-feet-by-four-feet raised panels, oriented and angled to capture optimal energy from the sun. 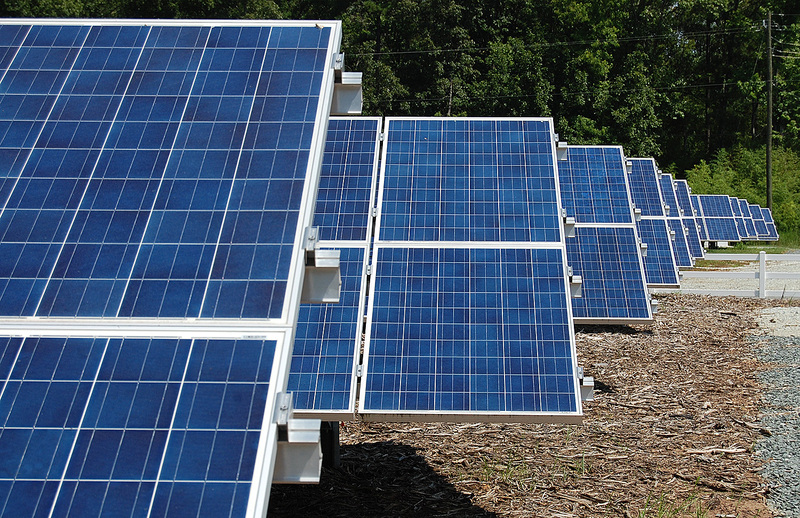 The panels generate direct current voltage from the sun’s energy and are connected in groups that, in turn, are connected to power inverters. The inverters produce useable alternating current, like the power we get from wall outlets. Current projections are for the project to cost $1.7 million with a break-even point in a little more than 15 years. UNC could make out better than that depending on battery pricing and the expectation that Duke will raise its rates over the next 15 years. A $75,000 solar rebate from Duke Energy also will help defray some initial costs. As the solar project nears completion, planners hope to create a viewing area on site for the public to see real-time data — such as weather and solar output — that affects energy use and the decisions that go into utilizing solar energy.